Soak the bread in eggnog in a large mixing bowl. Press with hands until well mixed and all the milk is absorbed. In a separate bowl, beat eggs, sugar, vanilla and spices together. Gently stir into the bread mixture. Gently stir the hazelnuts into the mixture. Add sugar to a heavy bottom pot. Whisk sugar and cook at medium heat until the sugar melts and reaches 350 degrees. Add butter and cook until completely melted. Add the chili powder and cream and whisk until the sauce is completely cooked through. Pull caramel off burner and add sea salt. Cool to room temperature and then store in fridge until using. Warm before serving. Pour caramel sauce over cooked bread pudding. Place fruit and sugar in heavy bottom saucepan and heat to medium. Once sugar has melted, then add the lemon juice and salt. Add cognac and flame up with matches. 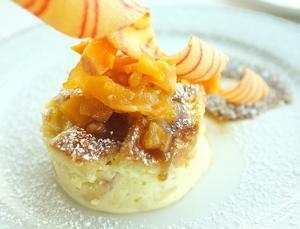 Sprinkle over bread pudding after caramel sauce.